For many people, whenever the subject of “bush flying” comes up, a Piper Cub fitted with floats, skis or tundra tires is the first image that comes to mind. Originally manufactured by Piper as the PA-18, the Super Cub was an advanced model of the J-3 Cub that featured a strengthened airframe, wing flaps and a more powerful engine. This small, rugged, two-place aircraft with excellent STOL capabilities, easily handles the very small landing areas in the back country areas that exist in Alaska and Canada. 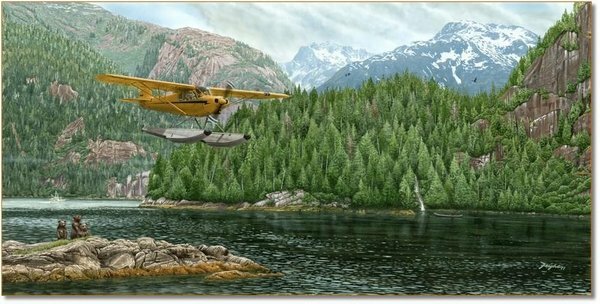 In fact, a float equipped aircraft such as the Cub depicted in this image operating in the Misty Fjords of Southeast Alaska, is the only way in and out of such wilderness areas that may only be accessible by boat.